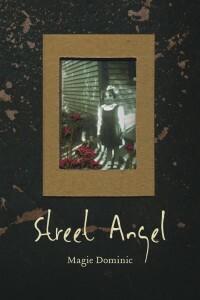 This year our good friend Magie Dominic published “Street Angel”, a memoir of her native Newfoundland. 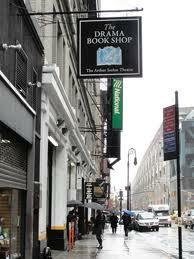 Not long after we arrived in the land of off-off-Broadway, we found ourselves in very good company. Marshall directed two of us in world premieres of Lanford Wilson plays in 1965: Dad (George Harris, Sr.) in “This Is The Rill Speaking” at the Caffe Cino; and Walter Michael Harris in “The Sandcastle” at La MaMa. In 1967, Marshall directed an all-star cast that included Jayne Anne Harris in Claris Nelson’s “The Clown” at the Cino. Also that year he invited Walter to reprise his role as Kenny in “The Sandcastle” – a revival that ran first at La MaMa and was extended at the Cino. These shows were rich experiences that helped us grow as artists. 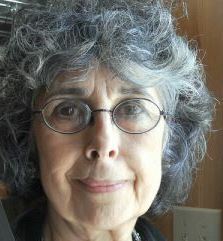 Marshall’s example became our gold standard of how a director works effectively with playwrights, actors and designers. He was a class act from Day One, and a pleasure to work with. 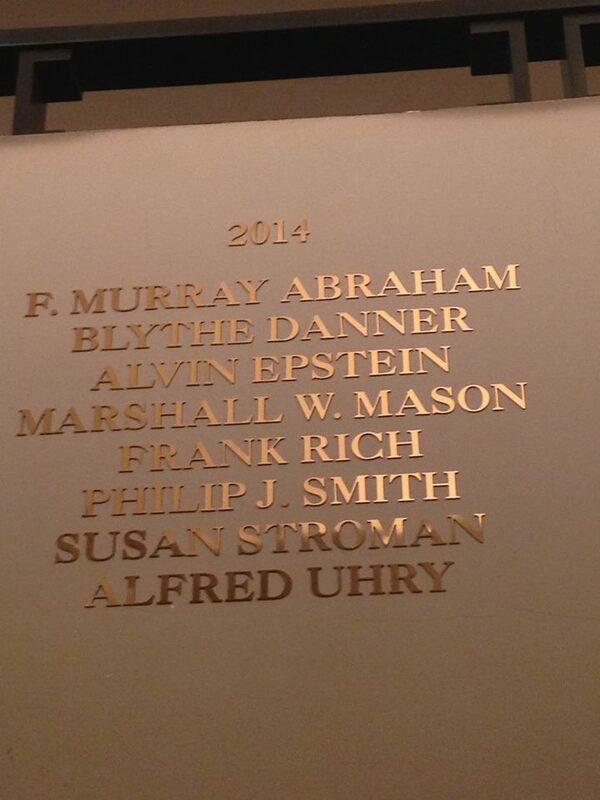 So it comes as no surprise to us that Marshall is being recognized and honored in this way. “I’m so grateful this honor is not being bestowed posthumously. 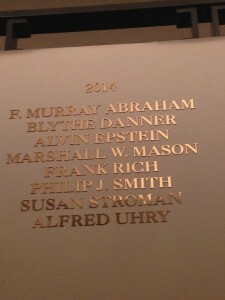 What a privilege to be inscribed among the names of the great directors of the past: David Belasco, Orson Welles, Tyrone Guthrie, Peter Brook, Garson Kanin, Mike Nichols and, my artistic hero, Elia Kazan. This reward is for a lifetime of doing what I loved, so I must thank my mentors who guided my path to this moment: Harold Clurman, Lee Strasberg and, especially, Alvina Krause. It would be disingenuous of me not to also mention Mel Gussow. When I founded Circle Repertory Company, I followed visionary trailblazers like Eva La Gallienne, Margo Jones, Joe Cino, Ellen Stewart and Joe Chaiken. Enlarging my vision were my inspirations: Tennessee Williams, Francois Truffaut, John Gielgud, Marlon Brando, James Dean, Laurence Olivier, Kim Stanley and Cat Stevens. 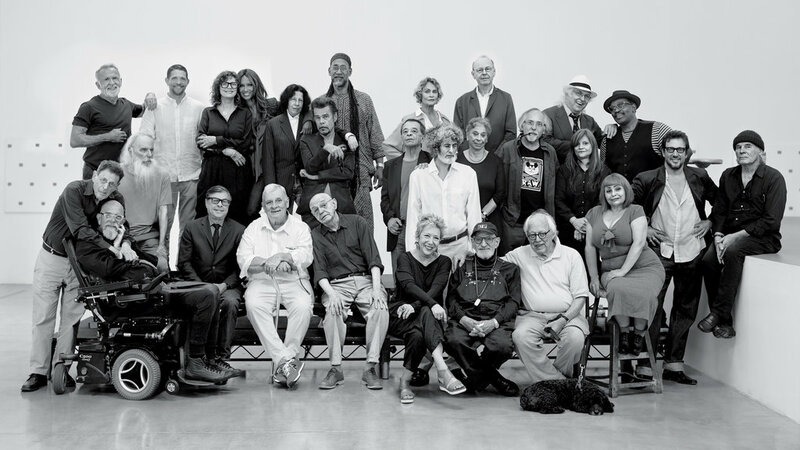 Always before me were the examples of enduring creative relationships: Chekhov and Stanislavski, Lindsay and Crouse, Rogers and Hammerstein, Mick Jagger and Keith Richards. Lanford Wilson and I were proud to join that list, with the longest collaboration between a playwright and director in the history of the American Theater. Lance, you’re still here. This recognition is a celebration of my colleagues: John Lee Beatty, Rob Thirkield, Tanya Berezin, William Hurt, Trish Hawkins, Judd Hirsch, Nancy Snyder, Jonathan Hogan, Swoosie Kurtz, Jeff Daniels, Helen Stenborg, Richard Thomas, Debra Monk, Bill Hoffman, John Bishop, my Stage Managers Margo Channing & Eve Harrington, otherwise known as Fred Reinglas & Denise Yaney, and the amazing company of actors, playwrights and designers who were Circle Rep.
A personal thanks to Rand Mitchell, my Assistant for many productions, who advised me on details I was inclined to overlook, like the high-heeled shoes of my leading ladies. 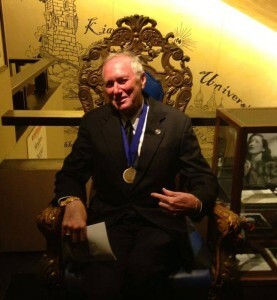 Also to my good neighbor George Atty for kindnesses too numerous to mention. And to my faithful friend, who´s here tonight, my Gal Friday, Saturday, Sunday, Monday, Tuesday Wednesday and Thursday, Glenna Clay. Always sharing my journey to this peak was mi compañero of 40 years, and mi esposo for the last four, Danny Irvine. Monday—Saturday: 11:00 a.m. to 7:00 p.m.
Caravan to Oz is narrated by family members and guests including Oscar-winning actor/director Tim Robbins, theater producers Ellen Stewart, Crystal Field and Ritsaert ten Cate, playwrights Robert Patrick and Robert Heide, filmmakers Scott Morris and Mike Figgis, and educator John Bernhardt. It’s not easy raising six kids in the arts. But the outlier Harrises answer every challenge on their personal yellow brick road with courage and commitment. Their pioneering journey offers something to anyone who is driven by a dream. The Harris Sisters – Had an all-access pass to the greatest music scene on earth! Off-Off Broadway theater was our first home. For two decades, The Harris Sisters (Jayne Anne, Eloise and Mary Lou) and the rest of our family performed in original drama and musicals at New York City’s La Mama ETC., Caffe Cino, Joseph Papp’s New York Shakespeare Festival Public Theater, Theater for the New City, Judson Poets Theater and more. 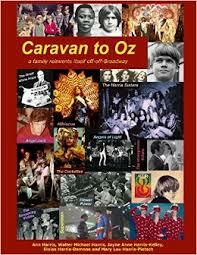 They travelled across Europe with their brother Hibiscus and his Angels of Light Theater troupe. Inspired by the beat of the New York punk and rock scene of the late 1970’s, The Harris Sisters and Trouble (our band), led by brother Fred, included bassist Ray Ploutz, guitarists Bill Davis and Josh Callow and drummers Mike Pedulla and Mike Kimmel, played at CBGB, SNAFU, Great Gildersleeves, The Mudd Club, RT Firefly, Peppermint Lounge and other rock venues of the day. 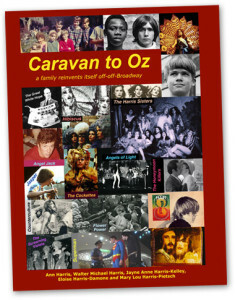 Caravan to Oz is a chronicle of one of the most unique families of the off off Broadway stage and screen. The saga begins with Ann and George Harris, Sr. (Superman, 1978), where life and art converged in a small D.I.Y. garage theater in Florida. Just like the old Judy Garland and Mickey Rooney films Anne and George Sr. took themselves and their six “babes in arms” to acclaim to stages throughout New York City and Europe. 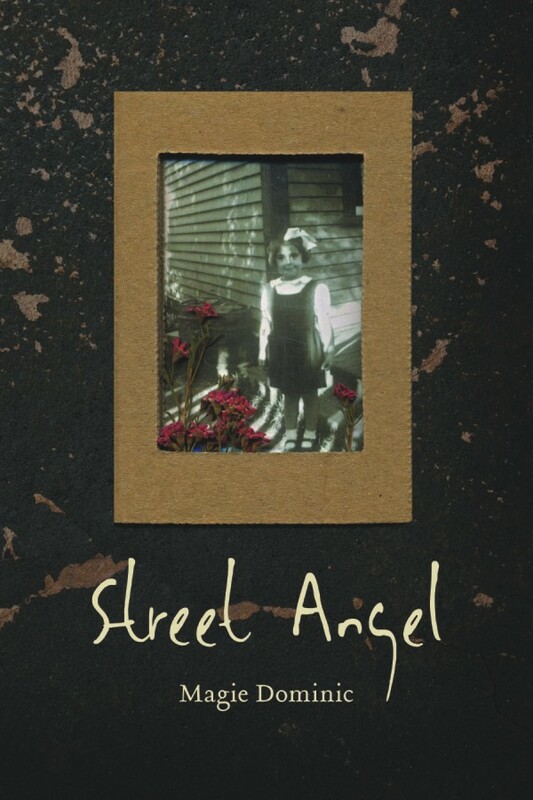 The cast of this family memoir ranges from La Mama’s Ellen Stewart to Oscar winning actor / director Tim Robbins. The candid pictures and narrations from the Harris siblings is a “how to survive guide” for any hopeful thespian or artist in this new depression era. The memoir answers every question, challenge, and tells it like it is … behind every TV, IMDB film credit or theater credit there is the day job or in the case of The Screaming Violets: Jayne, Eloise, and Mary Lou – a night job at the coat check at Studio 54. 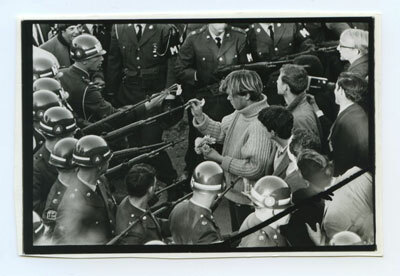 Besides the nail-biting, high risk-taking for the sake of art making there is tragedy ranging from losing Hibiscus to HIV/ AIDS causes (the renowned performance artist and founder of the psychedelic theater troupe The Cockettes) to 9/11 and its effect on the Harris family and their own survival and need for further reinvention. 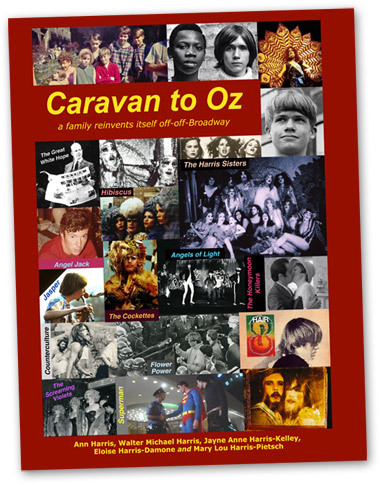 Caravan to Oz shares the highs and the “do or die” of the artist’s way (… and then some). What is refreshing is that book is full of living and not replete with backstabbing or name dropping of most memoirs. The names that are dropped however throughout the picture packed pages just happen to have graced the lives of Anne, George, Sr. Hibiscus, Walter-Michael, Frederic, Jayne, Eloise, and Mary Lou Harris. A must read for theater enthusiasts, academics or emerging D.I.Y. performers. Timothy Bellavia is an Educator, Author, and Owner/Founder at “We Are All The Same Inside”.